Self Propelled Gun – 600 built. The prolific AMX-13 spawned a variety of vehicles based on its chassis throughout thirty years. Among these were at least five self-propelled guns models. 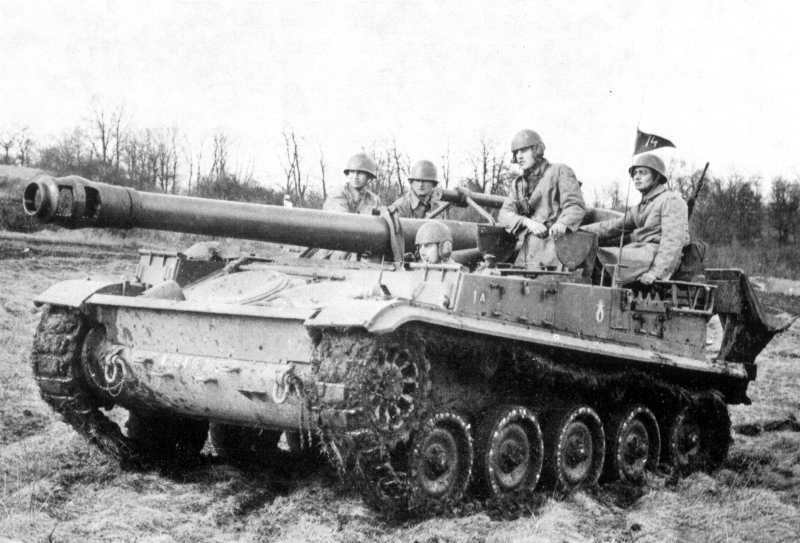 One of these, the Canon de 155 mm Mle F3 Automoteur was thought to replace the aging American M41 Gorilla 155mm self-propelled guns (based on the M24 Chaffee) in service with the French Army. It was designed by AMX between 1952 and 1960 and put into service in 1962. Production spanned at least two decades and it was also exported to nine other countries. 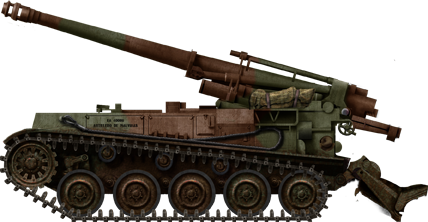 It offered then the most advantageous firepower-to-weight ratio for an SPG with this caliber, but with serious tradeoffs. 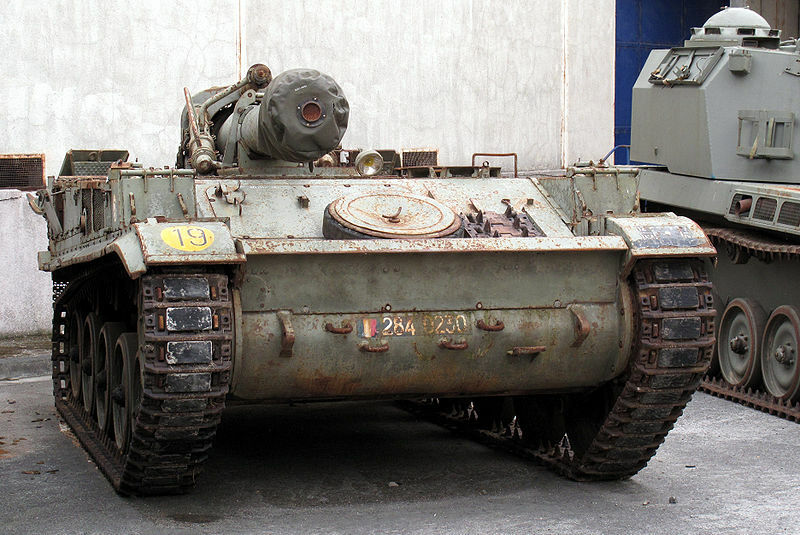 The Mk F3 155 mm retained the AMX-13 light tank chassis front part, but the rear was shortened and heavily modified. The drive sprocket was completely ommitted, and there was a pronounced recess towards the rear, to accomodate the gun recoil, elevating and traversing mechanisms and hydraulic spades (which reversed into the ground for added stability when firing) in a single, compact package. The welded hull was lightly armored, 10 to 20 mm, with a conventional layout: The Driver seated at the front-left, protected by a splashboard, with a single-piece, three periscopes hatch (and center optional night vision block), left-opening. The 250 hp 8Gxb eight-cylinder gasoline SOFAM Engine was placed to the front right and the 155 mm placed in a cradle slightly offset to the right and rear. The commander was located behind the driver, with a two-piece hatch and three daylight periscopes. However, the six gun servants needed to travel with another vehicle, at that time an AMX-VCI, along with 25 rounds of ammunitions. The F3 gun fired HE, smoke, illumination and rocket-assisted rounds up to an effective range of 20,050 m (with HE). The drivetrain comprised the front drive sprockets, five doubled ruberrized roadwheels, the most rearwards acting as idlers, and three return rollers per side. Suspension units were torsion bars, while the first and last unit was reinforced by hydraulic shock-absorbers. The hull’s sides accomodate Stowage containers and a loudspeaker and a cable reel were also carried. This lightweight vehicle was air-transportable if needed but not NBC proofed. The chassis was produced in a modified version by Atelier de Construction Roanne (ARE). 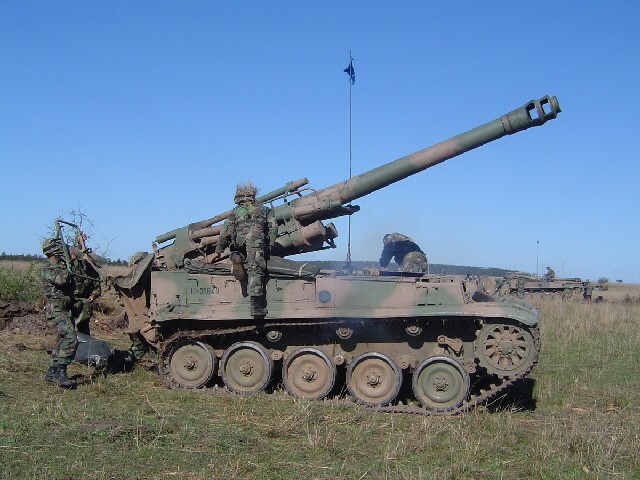 The 155 mm was designed by the Atelier de Construction de Tarbes (ATS), and its integration was assumed by the Etudes et de Fabrications d’Armement de Bourges (EFAB). Final assembly was then performed at Mécanique Creusot-Loire. In total its estimated that 600 vehicles were out and apparently the production only stopped in 1997, then handed over by Nexter and then GIAT. 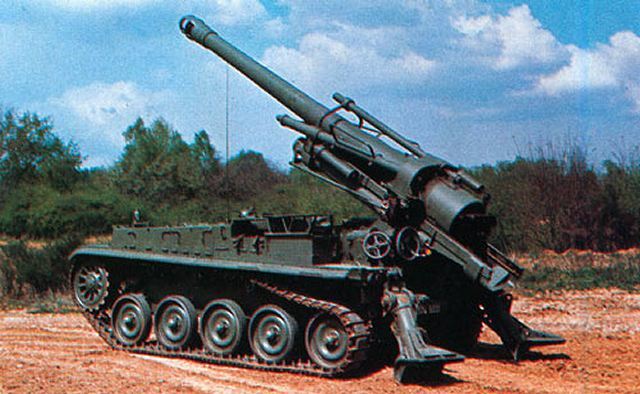 By 1977, the Mk F3 155 mm was superseded in the French army by the all-enclosed AuF1 155 mm GCT and production focused entirely ion the export market, where it was successful. This small and affordable SPG met customers in South America: Argentina (24), Chile (20), Ecuador (15), Peru (12), and Venezuela (20); North Africa and the Middle East (Morocco (100), Saudi Arabia (? ), Qatar (22)), and the mediterranean with Cyprus (12). They were often chosen because of the commonality of parts with the AMX-13 already in service. But in French service, the lack both of NBC protection or basic protection for the operating crew, which had to be carried separately, remained an issue for a cold war vehicle. Unidentified unit of the Ejército Argentino, 1980s. 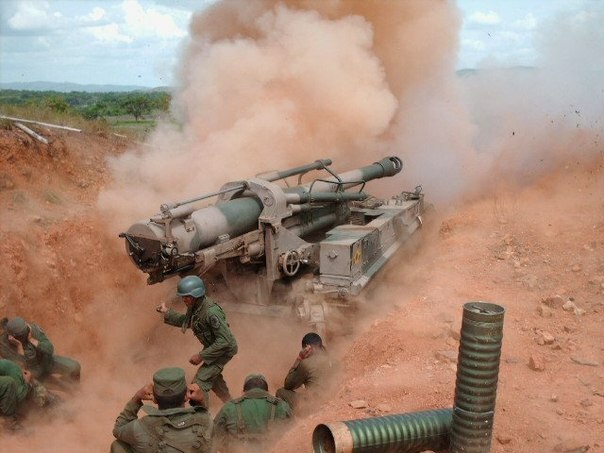 4th Venezuelian armoured division, 415th self propelled arti group, maracay, 2007. 20th Cypriot armoured brigade, Nicosia october 2008. AMX F3 155 mm in Saudi or Qatari desert tan livery, 1980s. It’s not “Fuerza Argentina”: That would mean something like “Argentine Force” wich doesn’t mean anything except by “Argentina Strongness”. The way that branch of the armed forces is called is “Ejército Argentino” – literally, Argentinian Army. On of the countries that used the Mk f3 Artillery piece is kuwait , It was used in the 1973 Arab-israeli war in the golan heights by the Jahra task force , it was very effective and it was direct on target , there is a trivial funny story that one of the gunners was used to enjoy music while firing that even when the cease fire was called he was still firing on targets not knowing that there was a ceasefire going on , anyway i really like to be added as one of the users of this arty peice they used 12 of them . In 1969 I serviced in the Dutch army in particular the 42 anti tank artillery init. I specialised maintain/repair the AMX-13 PRI/PRA and crane or towing type. I learned a loth on these nice vehickles in Steenwijkerwold Holland. The Chilean army never had more than 20. 8 were purchased from France in the 1970s. A further 12 were bought from Belgian stocks in the 1990s. The second batch had disel engines. They have all been retired and are out of sevice.